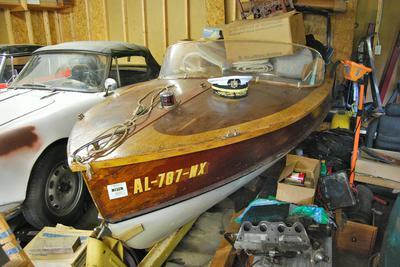 This is a mid or late 50's boat named Jay Craft. Purchased from the original owner's family, no known manufacturer's history. Has a chrome placard 'Shelbyville, TN'. Powered by an original Evinrude, it will be relocated soon, from where it rested for 40 years. Anyone with info on this brand please reply. My efforts resulted in no luck. Also, the hull is sound, but there is an raised small strip of wood that goes from the center bow to under the front hull, with a metal strip affixed, presumably for rubbing on trailer etc. This strip of wood is damaged just under the bow and needs about 2' replaced. It's only about half an inch thick and half inch wide. Looks like from repeated loading on the Tee Nee trailer rollers. I also plan to put water inside the hull to hydrate it. No idea what kind of wood it has. 2.I no my mom and dads name and everyone else 3.there boats were the best ever made... I am impressed that they made a legitimate beautiful memory to all!! YOUR DADS NAME IS ARNOLD,YOUR MOTHER IS VIOLA, VERN LIVED ON LAKE GOODWIN AND WAS MARRIED TO JEAN. MY FATHER MARVELL AND HIS 2 BROTHERS OWNED JACOBSEN BROS.
BOAT WORKS IN ARLINGTON WASHINGTON. THE WOOD IS MOST LIKELY WHITE OAK. They didn't close down in the 60's more like the mid to late 70's. My dad and his two brothers made the most outstanding beautiful boats here in Arlington, Washington. They put their love heart and soul into every wooden boat they designed and made. I am so proud of my dad and his brothers. You have kept the boat in terrific condition. Apologies! The boat I have is a Ray Craft, not a Jay Craft.....The painted logo was hard to read when I first saw it. So who made Ray Craft's? The blog is really interesting and worthy. I responded to your email address but haven't heard back from you. I'm looking forward to hearing back from you about the origin of this boat and if it was manufactured by the Jacobsen's. I had contacted the Chamber of Commerce in Shelbyville, Tennessee, but no one had any substantive info on the place of manufacture for this Jay Craft branded boat. I can't tell you when they built it but I can tell you who and where. My Grandfather Arnold and his brothers Marv, and Vern Jacobsen had a wooden boat business up in Arlington, WA. Closed down in the sixties. They made a bunch of different styles. They had to shut down because fiberglass was the new demand. All of the Jacobsen brothers have passed away. Please let me know if you would ever be interested in selling. Would love to have something my family built.